Documentaries can often be a nice change of pace for any film aficionado that has spent years scouring through obscure lists of unknown rarities, to find something good to watch. For although not all docus are exceptionally good, they are usually at least parts that are really interesting. And so the overall quality of documentaries is generally higher than that of feature films. But even though docus, just like features, have sub genres too, they often tend to be a bit formulaic. Most open with the presentation of a problem, followed by a journalistic dig through different forms of evidence, usually by the help of a pleasant voice over. How then about the documentary to end all documentaries? F for Fake might very well be that film. It goes beyond boundaries and creates a whole new genre of film, which have yet to be properly followed: The filmatic essay. 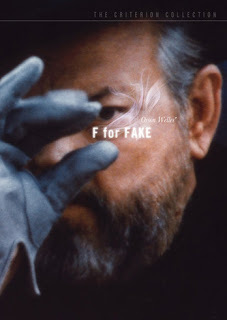 The director, Orson Welles, created a work of art with F for Fake, that ponders upon the subject of fake art, and the last century's most famous fakers. But it does more than just ponder. Welles uses the medium in a most ingenious way and takes the viewer on a roller coaster ride through forged hoops and counterfeit reality checks. Taking the role of both narrator, mastermind super-villain and victim, Welles continuously changes places with us, the viewers. You might think you've got a grip on what is going on one minute, unconsciously nodding away as Orson's guttural voice slides its deep promises of explanation from the screen, only to find everything turned on its head the next. For contrary to most documentaries, F for Fake sets out to confuse you, to trick you and create a fake universe of its own. And it is most successful. In the end it is not easy to understand what it was all about, but you will be happy all the same. Because this film is one you do not want to miss.